To date, experts using the Directly platform have resolved 76% of support tickets on average and escalated just 24% to our customers' internal help desks. A number of customer service leaders have asked for easier ways 1) to track the escalation reason and 2) to control who's involved in the interaction afterwards. The goal is to provide a smoother experience when passing a customer from the expert community to company help desks. Today we've released new features to address both requests. Now the experts' escalation notes can pass into Zendesk, Desk.com and Salesforce Service Cloud as a private note or comment in the ticket. The help desk agents can see the escalation reason -- in addition to the conversation thread -- so they can provide customers with more personalized answers. To activate escalation notes, head to the Helpdesk integration tab in your Directly admin panel, scroll to the bottom of the page, select Log escalation reason as private comment, and click Save changes. 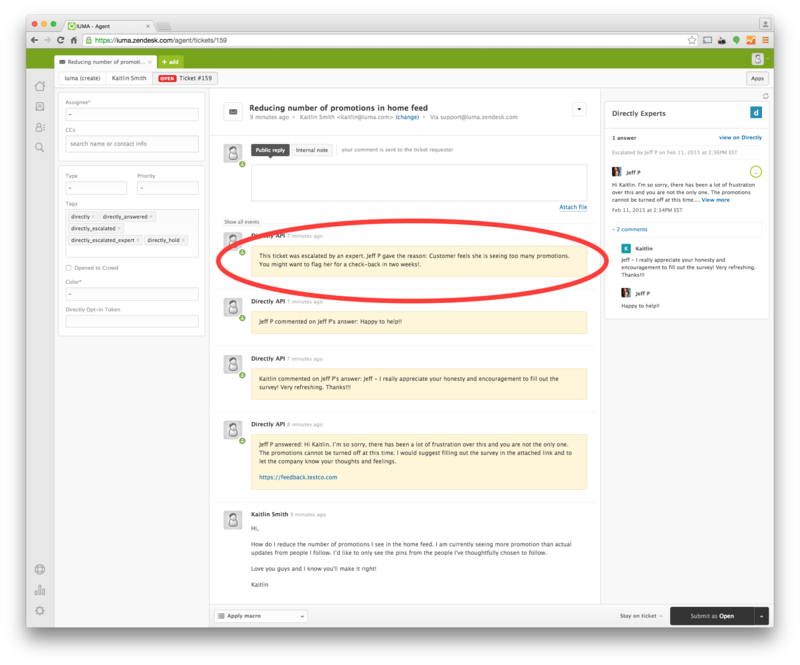 Expert community comments are closed in the Directly platform after a ticket is escalated to the help desk. To restrict interactions after an escalation, please get in touch with your Directly account rep or give me a shout at jeff@directly.com.